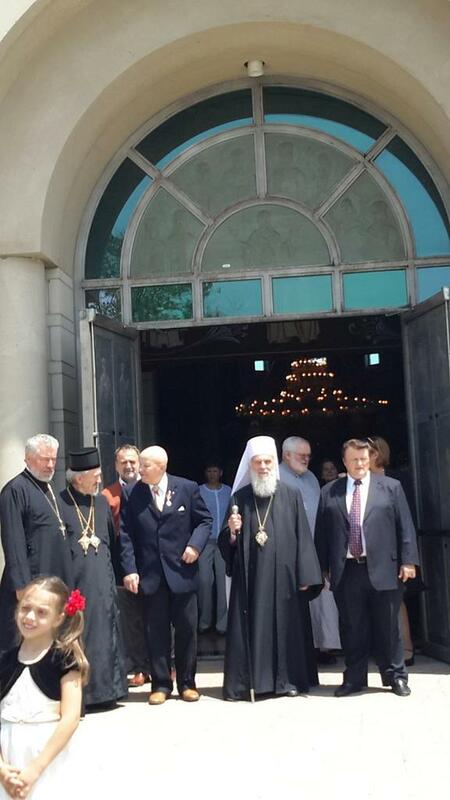 Mississauga, Ontario - On Saturday, June 20, 2015 His Holiness Serbian Patriarch Irinej visited the Serbian community in Mississauga. 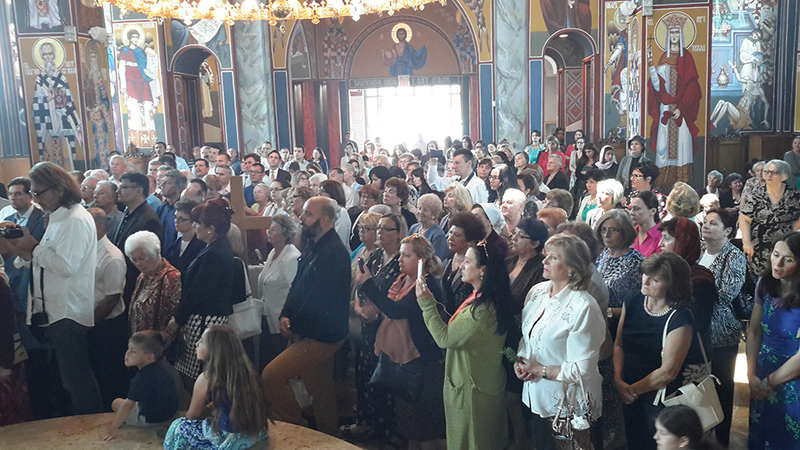 Many of the faithful gathered in front of the church before the liturgy, that they might welcome their Patriarch and received his blessing. 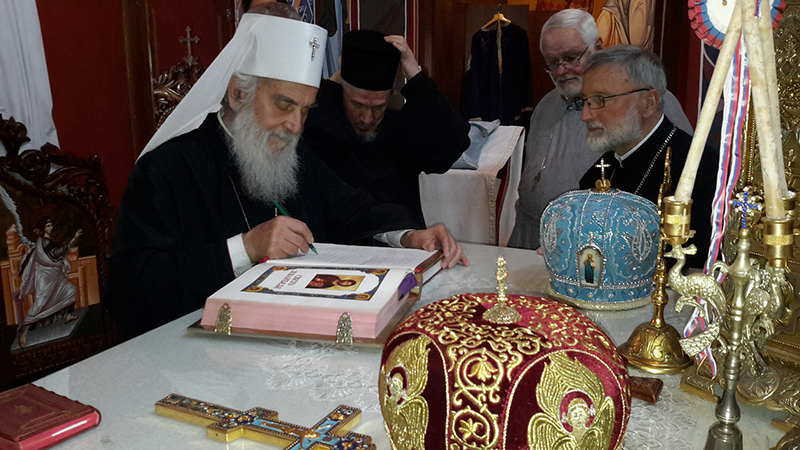 The Holy Hierarchical Liturgy was served by two hierarchs of our holy Church: Serbian Patriarch Irinej and His Grace Bishop Mitrophan of Eastern America. Concelebrating with them were clergy from metro Toronto: V. Rev. Stavrophor Vasilije Tomic, Episcopal Deputy, V. Rev. Stavrophor Lazar Vukojev, V. Rev. Stavrophor Milutin Veljkov, V. Rev. Stavrophor Prvoslav Puric, V. Rev. Stavrophor Dragoslav Ninkovic, V. Rev. Stavrophor Milojko Dimitric, Protosindjel Vasilije (Gavrilovic) and Protodeacon Damjan Bozic and Deacon Djuradj Kojic. 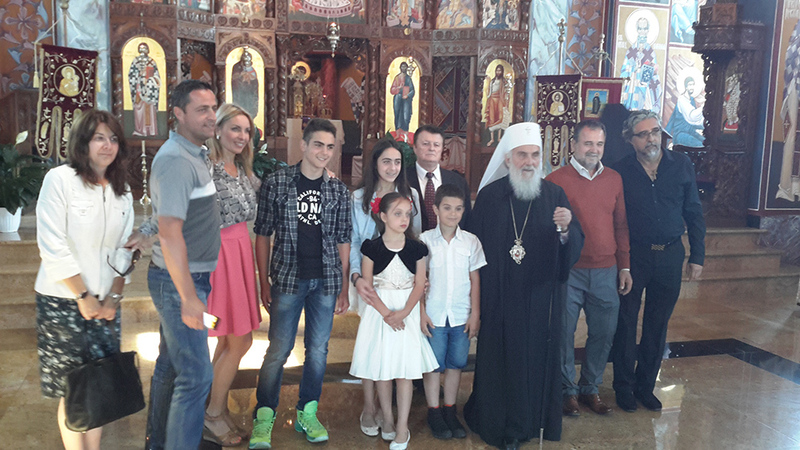 Adding to the beauty of the service were the voices of the "St. Sava" choir. After forty six years this choir, which actively participates in the work of the St. Sava Church in Toronto, moved in 2011 to the Synaxis of Serbian Saints Church in Mississauga. 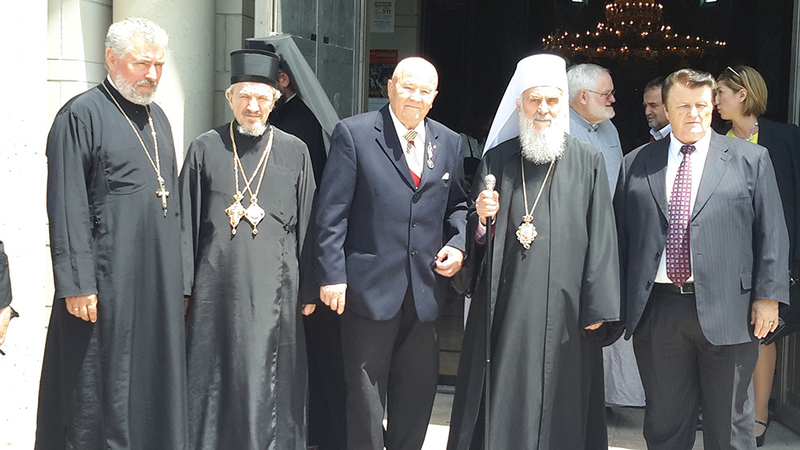 Here they continued with their program of both preserving the culture of Serbian music, language and folklore, as well as promoting and maintaining the Serbian Orthodox faith. Besides regularly singing the responses at the liturgies the concert organizes concerts, visits and actively participates in the life of the Church. They known especially for their humanitarian dinners for the children and mothers of Kosovo and Metohija, and singing at all church feasts such as Badnje Vece, Christmas, Easter or the St. Sava Acadamy and church slava. Besides them was the gifted priest V. Rev. Stavrophor Ljubomir Rajic who serves this parish. This gifted and honorable priest with his beautiful voice sang all the verses. 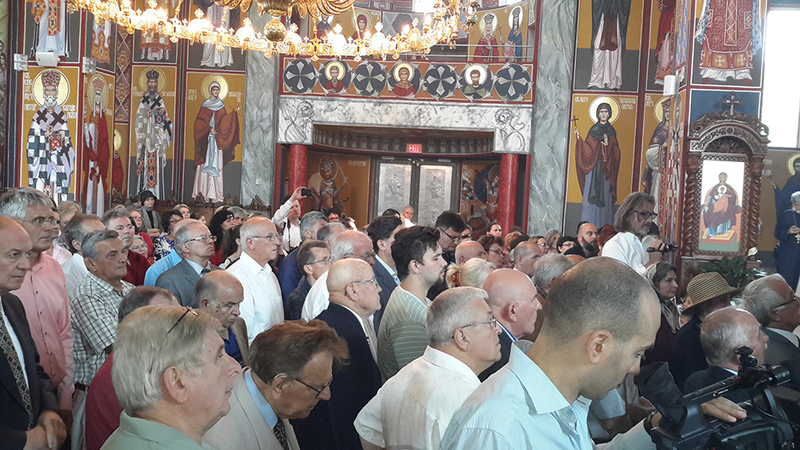 At the end of the liturgy, Patriarch Irinej delivered words of support to the peope how they are to endure all the temptations which follow them in the distant land. 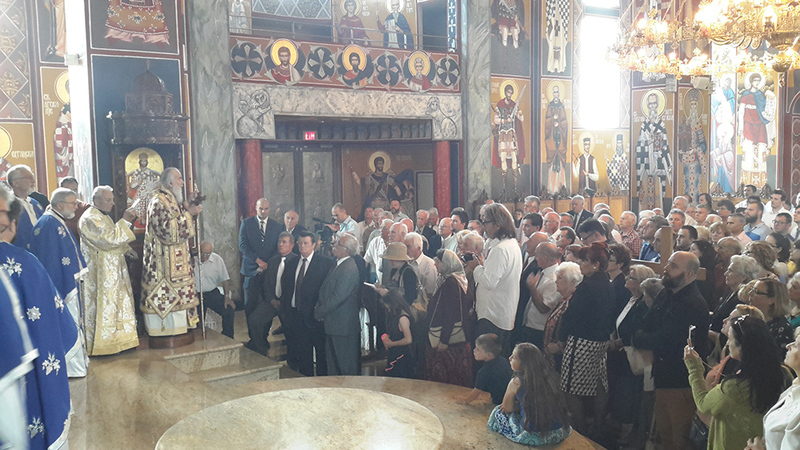 He greeted their efforts and works, expressing his hope that they will continue on this path, on the path and footsteps of Saint Sava. We have a model and an example, we only need to follow him. The Church of the Synaxis of Serbian Saints was consecrated in 2012. This church has two parishes: the first and third Toronto parish. Construction of the church began in 1994. 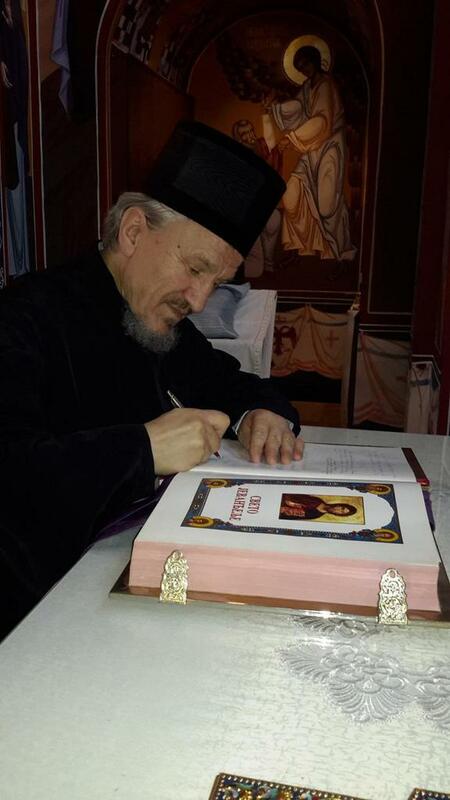 The cornerstone was consecrated by Patriarch Pavle. 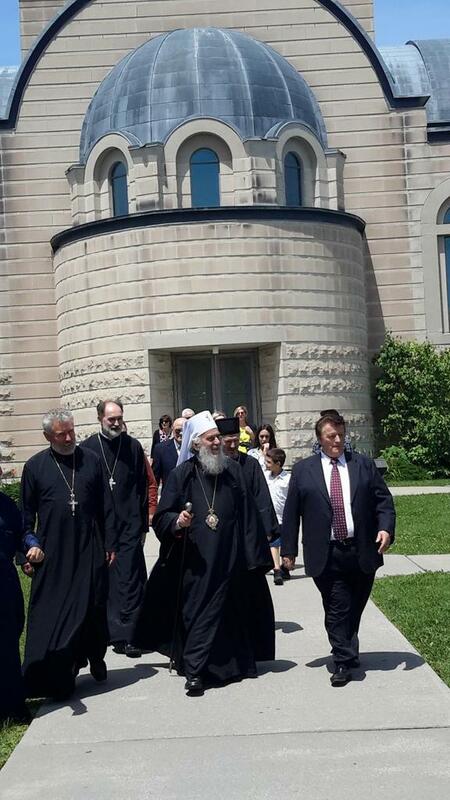 Twelve hierarchs of the Serbian Orthodox Church took part in the consecration of this largest Serbian church in Canada in 2002. The consecration on June 16, 2002 was followed by a four-day program with the participation of thousands of faithful.